I have been shooting a number of the London Lions home games at the Copper Box Arena at the Olympic Park this season. It has been a great learning experience shooting a top level national professional team playing a great action sport that does not have the media following it deserves. Before the first Lions game I did the all the basic research; watched a number of NBA games on YouTube, read a few articles from top basketball photographers and got a feel for the style of a good basketball image. What I was not really prepared for and what came as a big surprise was just how close you could get to the action and I do mean close, and the free rein to shoot from almost any position. You can shoot from anywhere on court providing you follow a few simple rules - do not; get on the field of play, get in the way of the officials or the team bench, block the view of the VIPs and sponsors. The key thing here is there are not many photographers at these games so you can and I do move around court during the game to experiment different angles - but you need to be seated and cross legged works best. 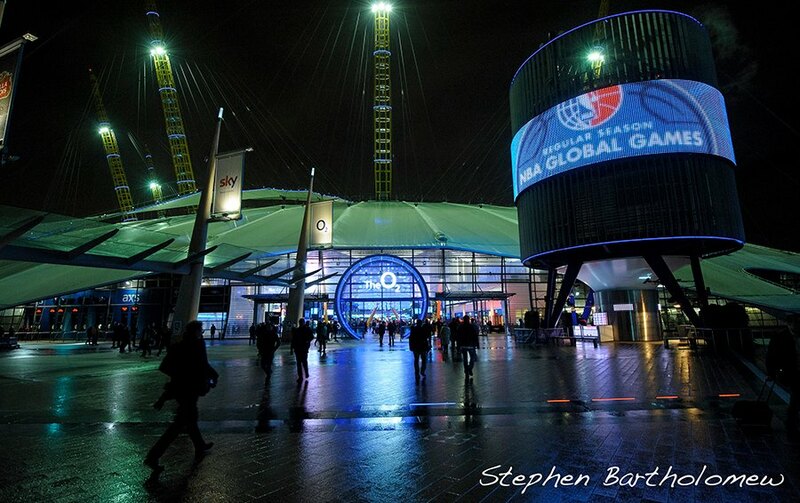 There was also a longer term ambition to shoot the NBA game in London. So I was really pleased to get media credentials for the Brooklyn Nets vs Atlanta Hawks regular season game at the O2 Arena and the pre-game media event on the preceding afternoon. The added bonus was that I had one of the few court side allocated photographer positions, although the downside, there is always a downside, the position had to be shared with a photographer from the Metro. The NBA media rep also reminded me about the NBA requirements for photographers to use “rubber lenses” when shooting court side and that I had to stay seated in the allocated position. My immediate concern was I’m not used to sitting cross legged, and especially for long periods and haven’t done so since the heady 70’s and even then I preferred a bean bag. So the following day was spent trying to track down one of those fold-up floor chairs that I have used in kayaks and canoes that give support to the back. A guy in the local fishing tackle shop told me he had seen them in a camping shop over in Essex, so a trip over to Lakeside and £15 later I had exactly what I needed. As for the rubber lenses - It seems there have been a few incidents in the US where players have fallen on photographers and the lens hoods have injured the players. So thoughts of litigation and million dollar compensation payments gave me a major problem to solve. Mark Greenwood a photographer mate of mine uses a neoprene knee support to protect one of his long lenses. One of Mark’s many talents is figuring out problems and solving them cheaply and I am sure he triumphantly told me he bought it in Poundland rather than pay upward of £100 for the purpose built photographic item. So I felt a real smart arse when I walked into the media room with my new found bespoke soft lens hoods to find a lot of photographers gaffer taping hoods and grumbling about stupid rules - Thanks Mark. I agreed with the guy from the Metro that I would do the second half, which suited my plan as I thought the Nets would win and they would be playing toward me. I could then do the pre-game interviews with the coaches and the NBA Commissioner David Stern in possibly his last media conference as he steps down after 30 years, wire the images off, do some wide shots from the galleries and then finish off the match from the position. As for the game, court side was manic, the position was not ideal as it gave a angle where most of the basket was behind the backboard, the view was often blocked by umpires, ball boys, sweaty towels and clothing frequently being thrown at the ball boys, tv crews, players coming on and off court, the game was of course faster and tended to came down the side lane and swing away toward the basket - but I had a great time and the Nets won 127-110. I used my Nikon D3’s with 70-200mm, 24-70mm court side and the fisheye lens and 200-400mm on a few frames from the top of the arena. ISO was between 1600-2500 at 1/800th using the available arena lighting, which even at the O2 is not that bright and in RAW to try and deal with skin tones and white balance issues. The chair worked really well and was really comfortable and nobody fell on me. I plan to shoot more basketball with the Lions this season, but I can now say I have covered NBA Basketball and survived thanks to a nice bloke at The Tacklebox, Dartford ‎and Poundland. If you are interested the small elbow support fits neatly on the Nikkor 70-200mm and 24-70mm. 16.01.2014 London, England. 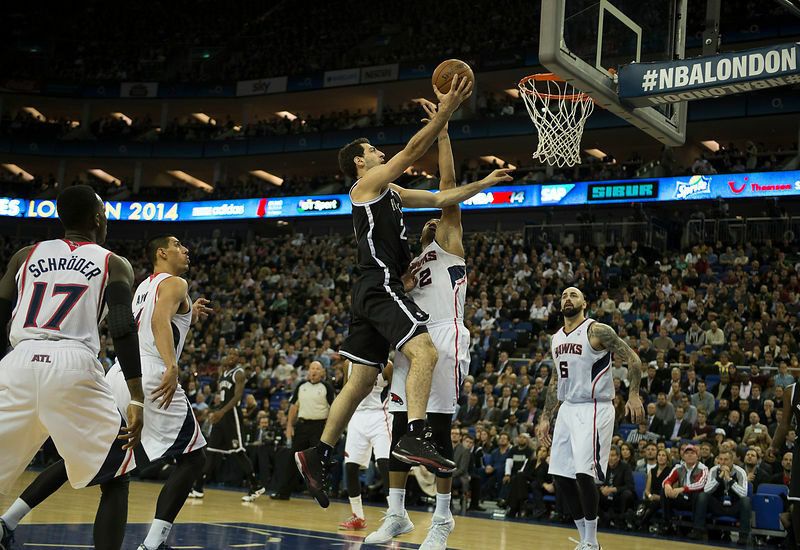 Brooklyn Nets’ Forward Tornike Shengelia  in action during the NBA regular season game between the Atlanta Hawks and the Brooklyn Nets from the O2 Arena.